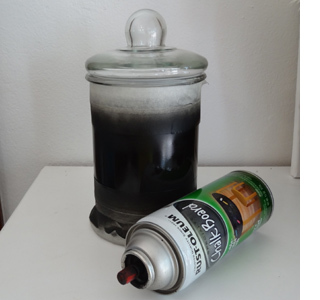 Rust-Oleum chalkboard spray has so many uses, but to tie in with our Colourful Kitchen article, I sprayed two glass jars (R39.99 at Mr Price Home) with chalkboard spray and added colourful designs with Bostik glass deco paints. Just one of the many ways to transform affordable decor accessories into unique pieces for any home. I love finding inexpensive home accessories that can easily be transformed with a few craft supplies. 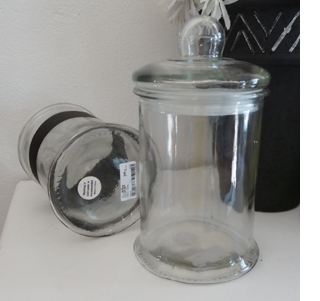 These airtight jars are perfect for use in the kitchen, bathroom or for storage in any room in a home. Rather than just keep them plain, I used chalkboard spray and puffy paint to add colourful designs. 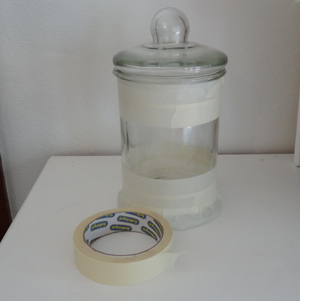 Before you spray you need to wrap with masking tape to cover the areas not being sprayed. I have noticed that the masking tape available at the moment is absolutely useless. It has no stick and easily peels off, so ensure that the edge is firmly stuck down before you spray. Apply two light - and I mean light - coats of Rust-Oleum chalkboard spray around the exposed area of glass. Let each coat dry before applying the next coat. If you spray on too much it only ends up running down, so light sprays please! 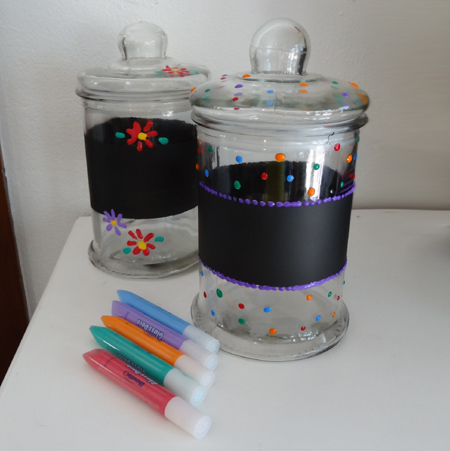 Remove the masking tape and add your colourful designs using glass deco or puffy paint. This paint is quite thick and doesn't slump or go flat when applied, it leaves a lovely raised design on the surface of the glass. 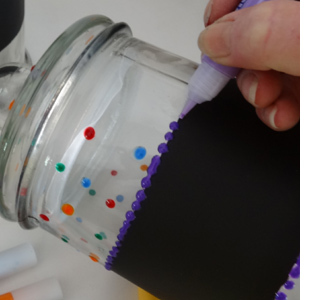 Work in small sections so that the paint has time to harden slightly before turning the jar to add more designs.